This holistic living retreat will help you to find balance and nourish your body and soul to make you glow from the inside out. You will learn how to prepare quick and healthy meals, incorporate grounding rituals in your daily life and develop a yoga self practice. During the week together, you will start each day with a morning get together and chat over tea / coffee and snacks followed by an optional meditation and breathing practice at the beach. You will have an energizing yoga class led by Teresa while Aneta will prepare a delicious healthy brunch. After brunch, there is a cooking class, nutrition / health workshop or farmers market visit. In the afternoon, you will have time to rest, explore the beautiful surrounding beaches, walk jungle paths, take a surf lesson, stroll through town, or simply relax at the beach or private pool. 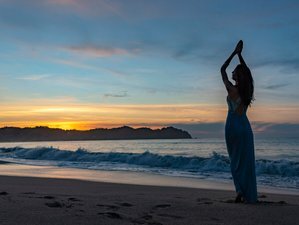 The afternoon offers a second yoga class geared towards restoring and relaxation followed by dinner and on some days an optional evening activity. Join them for an unforgettable week of relaxation, fun, and connection in the lush nature of Sayulita! The retreat is limited to 12 participants to ensure an intimate, family-like atmosphere of connection, love, and mutual support. We will take you on a journey into health and happiness. We aim to impact and inspire people way beyond the experience of our one week of rejuvenation.